“Reality cannot survive another crisis,” says a character in the latest issue of Justice League. Dare we hope reboots are a thing of the past for DC Comics? There’s another cosmic editorial event coming to the DC Universe. No, not the Convergence that’s happening now. Another one that they’re calling The Darkseid War. Yes, they do that kind of thing a lot. Weirdly, the latest issue of DC Comics’ premier superteam book holds a bit of meta-commentary that apparently concedes that they probably go to that particular narrative well too much. Here’s the relevant sequence from Justice League #40, where the all-knowing Metron—one of the New Gods created by Jack Kirby in the 1970s—talks to the Anti-Monitor. As die-hard DC enthusiasts know, the word “crisis” became the primary branding for all the times that DC did important or multiversal story arcs. 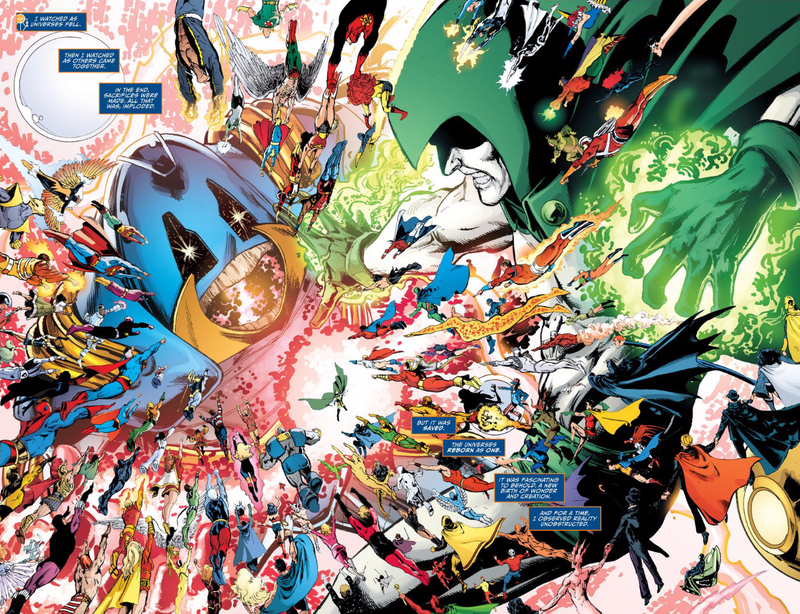 “Crisis on Earth-Three,” “Crisis on Infinite Earths,” “Infinite Crisis,” “Final Crisis”... that kind of thing. That page above is preceded by Metron running down all the other times that DC’s pushed the reset button on their fictional history. One thing that’s interesting about the pages above is that they’re written by Geoff Johns, one of the three guys in charge of DC Comics editorial. Johns has been an important part of DC’s creative ecosystem for a long time and has himself been chief architect of a few of the publisher’s tentpole events. It’s telling that a man in his position writes the words “Reality cannot survive another crisis,” considering that he probably knows that they can be interpreted to read as either personal or institutional exhaustion with this plot trope. The other thing worth noting about this chunk of expository commentary is the timing. DC Comics’ entire line-up is going to be very different soon. The preview that the publisher offered a few months ago of their post-Convergence titles hints at radical changes in costumes, tone, and character and creator diversity. It’s a big gamble for them. Which sure makes it look like Johns’ words do in fact harbor some self-awareness about the diminishing returns of recurring cosmic crises. DC Comics might finally be realizing that they can’t coast on what they’ve done before. Or they might not.